You're invited to join us around the Legacy Table at The Cedars. The Cedars has been inspired by the unique and intimate art studio renowned artist Doris McCarthy created at Fool's Paradise. 7-Generation dialogue and learning that ripples out to create meaningful outcomes. We believe in the power of place to help effect change. The Cedars is part of 100 acres of working farm fields, wetlands, and woodland with walking trails. Nature can inspire and teach us, helping to spark bigger thinking as a muse, model and metaphor. The Cedar trees that surround the site are very resilient; trust a Cedar to find a small amount of soil in the cracks of a massive rock and flourish. The public areas at The Cedars include an informal loft space, with incredible views of miles of surrounding rolling hills of farmland and trees, and a small gallery featuring the Dream Exhibit, all of the original artwork from the award-winning bestseller Dream. The main floor meeting space is called the Natrium. Nearly two stories high, it has glass on three walls to blur the line between being outdoors and indoors. It connects visitors to the natural surroundings year-round, offering a one-of-a-kind space for meetings and discussions. In the center of the Natrium is the large Legacy Table, the heart of The Cedars, custom made of Heritage Maple and designed to evoke a tree. At The Cedars, we've adopted a variation on the old Irish blessing, "May you be in the right place, at the right time, with the right people, doing the right thing." 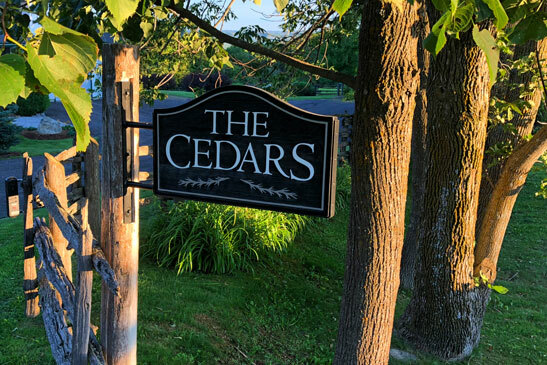 We look forward to seeing you at The Cedars.